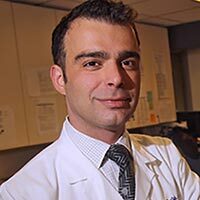 Dr. Fadi Braiteh is a medical oncologist at the Comprehensive Cancer Centers of Nevada (CCCN) with a special interest in lung cancer, pleural mesothelioma and other thoracic malignancies. Braiteh directs the Translational Oncology Program and the Gastro-Intestinal Malignancies Program at CCCN, spending considerable time looking for — and developing — more effective ways to treat his patients. Braiteh joined CCCN in 2010 after working at the Cancer and Hematology Centers of Western Michigan as the director of the Drug Development Center. He also was a scientific investigator for the translational medicine program at Van Andel Research Institute. He did his earlier training at the Yale School of Medicine in New Haven, Connecticut, and the University of Texas MD Anderson Cancer Center in Houston. He earned his medical degree in 1998 from Saint Joseph University in Beirut, Lebanon. In recent years, Braiteh has been at the forefront of immunotherapy drug development, serving as the primary investigator for numerous clinical trials at CCCN. He encourages his patients to enroll, aiding them as well as helping spark future advances. “We want [patients] to take the chance and be courageous with us, because without the patient in the clinical trials that we’re conducting, we are not going to win battle after battle with the war against cancer,” he said in a video interview with the Patient Empowerment Network. Braiteh sees his patients at the Central Valley Treatment Center in Las Vegas, one of a dozen facilities that are part of the CCCN network. Central Valley is a multidisciplinary treatment center that offers medical oncology, hematology and radiation services to patients with cancer or serious blood disorders. Braiteh has served as principal investigator in more than 200 clinical trials. His work has been published in The Lancet, Journal of Clinical Oncology, Nature, and The Oncologist. He lectures frequently on immunotherapy advances, clinical trials and palliative care. He also serves on numerous committees that are part of the American Society of Clinical Oncology. Disclaimer: Dr. Fadi Braiteh has no professional affiliation with Asbestos.com.